Ideal for fast food, restaurants, supermarkets, kitchens, etc. Easy lid opening via steel push rod. Ergonomic handle and big wheels. Utilise as a standard bin or customise with a range of accessories. 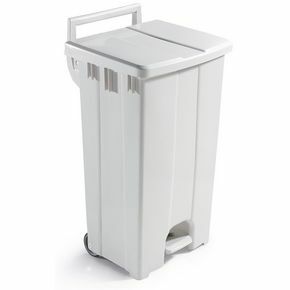 White body with choice of coloured lids for waste separation. H x W x D: 920 x 510 x 465mm.